In the early 1960s, counter-culture folk music, beat poetry, and subversive novels gained in popularity among young Americans, perhaps as a response to 1950s ideal of assimilation and the ongoing Vietnam War. Berkeley, California and New York City's Greenwich Village are considered to be the two major areas for this shift in the cultural paradigm. These cities saw folk performances, psychedelic rock, and a rise in LSD drug use, which some people credited to inducing psychedelic experiences. Hippie culture was first brought to the American consciousness by an event in San Francisco in 1967 called the Human Be-In. The Human Be-In was a gathering to protest a law banning the use of the drug LSD, which many hippies wanted to keep legal. Poets, including the well-known Alan Ginsberg, Gary Snyder, and Lawrence Ferlinghetti, spoke, as did many other social activists protesting the law. Often called the prelude to the Summer of Love, as it happened in January of 1967, right before the Summer of Love in 1967, the Human Be-In was, in a sense, the kick-off event for the hippie cultural revolution. 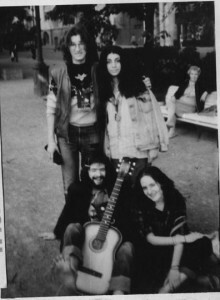 Some of the earliest "hippies" were university students living in California's Bay area. Many lived in an area of San Francisco called Haight-Ashbury, which became famous as one of the main areas for people looking to live the hippie lifestyle. Beginning in the late 1960s, after the Summer of Love, many so-called Hippie ideas about clothing, free love and music came to be adopted as part of mainstream cultural society around the world. The Woodstock Music Festival in 1969 is considered the culmination of the ascent of hippie culture in mainstream society. The documentary movie of the Woodstock Festival made in 1970, featuring legendary rock acts like Crosby, Stills & Nash, Jimi Hendrix, The Who, and Neil Young, was an enormous box office success. The movie's popularity pushed the idea of Hippie-inspired culture even further into ordinary society. The anti-Vietnam war movement at this time was peaking as well. Rallying and opposing the war gave hippies an issue to unite against as well as a platform for their ideals and art. Ultimately, the success of hippie-ism became its downfall. Counterculture as the mainstream is a paradox that is often unsustainable. By the 1970s, hippies experienced some backlash from other youth movement groups like the punk subculture. Disco music, heavy metal, and punk rock all came to compete with psychedelic rock and folk music. The ideas of hippie-ism may have been challenged during this time, but it would be wrong to say they were replaced completely. Ideas like pacifism, environmentalism, subversive art, and music festivals were all still popular after the 1970s and still survive in many different forms. Communes where hippies lived can still be found today, though they are not as common as in the 1960s. The word hipster has also become popular again since the early 2000s. The hipster culture today is also a counter-culture movement, with a focus on creativity, independent rock music, as well as irony in literature and film. Hipsters now are different than the people we called Hipster in the 1940s. It is less of a Jazz culture. The predominant musical form is probably Indie Rock. Hipsters can live anywhere but tend to be attracted to large urban areas, particularly if there is a vibrant art scene. Modern hipster culture may have been influenced by hippies, but the terms are not interchangeable. They refer to two completely different groups.